Welcome to Week 3 of the Calligraphy Portfolio Challenge - this one's all about photography! It's a topic that makes a lot of us stumble, quite frankly -- but it's a really important one to learn because calligraphy is such a visual medium. People will judge your work in mere seconds, so it's critical to show it in the best light. It's really easy to take bad pictures... ;-) but it's also really easy to make them 10 times better, as you'll see below! This week's challenge assumes you'll be taking your photos with a phone - no fancy camera needed. Step 1: Batch your photo shoots. The majority of that time was spent gathering my gear and supplies and getting the lighting and background right. Actually snapping a few different photos, and editing them on my phone, took all of 10 minutes. So, you can see that if you're going to spend a chunk of time setting up, you might as well take photos of as many different projects as you can. You'll be much more efficient and have a nice collection of images in your "queue" to share over time on social media, your website, or your blog. As an added bonus, they'll have a consistent lighting and style to them. This efficiency from batching photos is why, last week, you focused on creating as many projects as you could - so you could photograph them all at once and save yourself a lot of time. Step 2: Use natural light. You may have heard this one before, but it's touted as the number one rule in photography and styling for a reason - natural lighting makes a HUGE difference! The photo above from Week 1's email was shot in natural light. But I didn't put it in direct sunlight (that would create really harsh shadows). Instead, set up your scene in indirect natural light -- a desk near a window, the floor near your sliding door, or... in my case, my garage, near the open door. ;-) Watch the video below to see how I set it up. (The reflector I used is this one, which is about $20.) This type of image, shot from above, is called a "flat lay," and it's how most stationery scenes are photographed. You can experiment with your styling and props to find a layout you like, but remember not to fill your scene with so much "stuff" that it's distracting from your main focal point. (If you're a student of the Modern Calligraphy Summit 2.0, you should definitely watch Alissa and Aimee's photography and styling bonus video if you haven't already!) Good props for calligraphy work are vintage stamps, cute bowls or vessels, ribbons, plants and flowers, and pens and nibs of course! 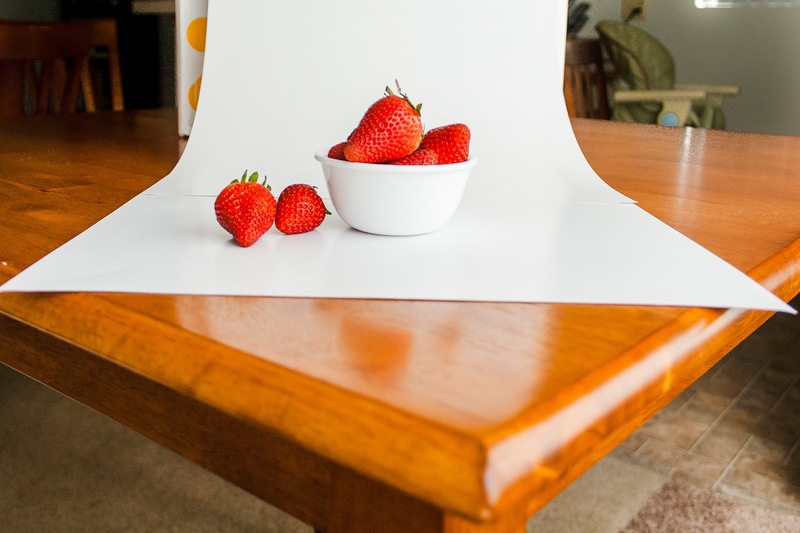 If you've got products like mugs or totes, a flat lay will work -- but you can also experiment with a setup like this one so you can take your photo from the front or side. Make sure to take lots of photos of a scene before you change it: move closer, move farther away, change the orientation (landscape vs. portrait), and crop in to get a little more detail on a particular area. The last thing you want is to clear your entire slate and then realize you didn't get a shot of that custom painted envelope liner! One more quick tip before we move onto editing: if you're using a phone for your camera, make sure to zoom in just a tiny bit before snapping your picture - this removes that wide angle, "fisheye" effect that some phones have, and will make your photo look more like it was shot with a professional camera. It's very rare that your photo will look great straight out of the camera (or phone). Check out the photo below on the left. That's what it looked like straight out of my iPhone. The final one on the right is after a bit of editing with a neat little app called VSCO, which is one of the best photo editors I've seen (and it's free). Some of your editing will be personal preference and brand-driven, but in general, you want the black in your photos to appear black, the whites to appear white, and the overall color to be neither too cool nor too warm. You can tell in the original photo on the left, the overall color was too cool, and the whites weren't white. The blacks in the pens weren't bad. But there was also a bit of shadow still from the frame that I wanted to get rid of. These are the most commonly adjusted settings, along with saturation (the intensity of the color), but feel free to play around with the other settings or even some of the presets that VSCO offers. Once you're happy with your photo, you can export it to your camera roll so it's ready to share later on Instagram. Of course, there are entire multi-module courses devoted to photography and styling, and you can really get in-depth on lighting, composition, camera settings, etc. But if you've been struggling with photography, these quick tips will really make a big difference in your pictures - I think you'll be surprised! And before we go, here's one trick for improving your "eye" for styling: use Instagram's "Save" feature and start saving photographs that you like and feel drawn to. Once you've got three or four, print them out and lay a sheet of tracing paper over them. With a pencil, trace an outline of the various elements in each photo (like the stationery pieces, that pretty ribbon cutting across the top corner, or the little bowl of vintage stamps). Once you pull the trace paper away to look at just the outlines, you'll start to see different layouts and compositions that can inspire your next photo shoot. Have fun snapping away this week, and make sure to share those photos by tagging @moderncalligraphysummit and #mcscpc so we can see your progress!